Nearly a dozen Augsburg College McNair Scholars presented their summer research findings at the University of California, Berkeley's 20th Annual McNair Scholars Symposium, held August 2-5. 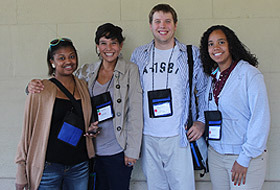 The symposium hosted students from colleges and universities across the United States. Scholars were paired with a faculty mentor in their discipline to gain extensive skills and knowledge, learn research methods, and practice writing and public speaking. 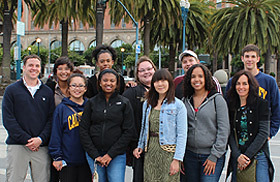 At the 2012 Berkeley McNair Scholars Symposium, student researchers spoke before an audience of academics, administrators, peers, and friends. They also attended informational sessions that detailed how to apply for advanced degree programs and took part in a graduate school fair at which recruiters represented institutions from across the nation. The U.S. Department of Education during fall 2012 renewed grant funding for the Augsburg College McNair Scholars Program.  Jazmine Darden '13 - Physics and Math | Completed an intensive summer internship with GISE and GEMS.  Nou Yang '13 - Computer Science | Impeding Businesses and Hindering Productivity: Would SOPA and PIPA Negatively Affect Businesses on the Internet? Mentor: William Green, Ph.D., J.D. Barrick's summer research project had three intertwined components, with the intersection being the U.S. – Dakota War of 1862. The first hinged on cultivating a Medicine Wheel community garden based on Dakota practices and beliefs. The garden was strategically located in his home town of Litchfield, Minn., which has geographical significance in the conflict. The second aspect of the project was to draw the attention of Meeker County residents to this historical moment to by offering information regarding the historical significance of the Litchfield region. The third was his own research on the history of the Dakota War. Benser researched issues surrounding stand-up comedy and social inequality, and she focused on the topics of race and sexual orientation. She used Erving Goffman's theories on impression management and frame analysis to identify methods employed by comedians and to determine which techniques are successful in framing comedy that addresses controversial topics. Benser found herself having conversations with individuals who were interested in similar topics after she presented her research at the McNair Symposium. "I was able to really see how my research could positively impact peoples' lives," she said. "This research could enhance the ways in which individuals bridge differences." As a 2012 Phillips Scholarship recipient, Darden completed an internship with the Girls in Engineering, Mathematics, and Science (GEMS) and Guys in Science and Engineering (GISE) programs at Augsburg College. She taught students about structural engineering through the use of bridges. Darden's summer project did not include preparing a presentation for the McNair Symposium. Darden in California was drawn to attend events that focused on her academic majors—physics and math—but she also learned about new subjects. "I expanded my horizon and started going to talks in other fields," she said. "It was great to listen to sociology presentations and now I am taking a course because I was so drawn in." Elkington conducted a phenomenological study that examined the impact of Zen meditation and psychotherapy on perceptions of self. Elkington interviewed four psychotherapists who each practice Zen meditation and psychotherapy. He sought to determine how psychotherapists and Zen practitioners overcome dissonance between the conventional self and non-self in Zen. "The McNair experience has helped me shape the groundwork for future research," Elkington said. "I will continue researching the history of self-conception as perceived in Eastern and Western philosophical, psychological, and spiritual thought with the hope of future publication in a journal or a book." "When I first came to Augsburg I had no intention of attending graduate school," Genis said. "But, presenting my research at Berkley, along with hundreds of other McNair scholars from all over the country, was an energizing and inspiring experience. It opened my eyes to the many different approaches people can take with research, and it definitely encouraged me to apply to graduate school." Moua asserts that instrumental Hmong folk music is largely unknown to most people; thus her personal goal was to document Hmong music and instruments to disseminate each to the wider academic community. Moua went out into Hmong communities and interviewed teachers and students of instrumental Hmong folk music. She explored the structure and form of the music. Ultimately, she hopes to contribute to a growing archive of Hmong history. Olson examined how the brain differs between states of perception. By performing visual stimulus tests using dots in random motion, Olson was able to dissociate perception from stimuli. The dissociation was mediated by change between connectivity of the brain. It is hypothesized that during a perception state, more connected activity between areas of the brain will be seen. Based on a previous study, a stable state of communication during a perception state was suggested. "I learned how to improve my methodological and writing skills through this project in an effort to prepare myself for further education," Olson said. Ritchea analyzed stories created by influential writer J.R.R. Tolkien in order to better understand the author's classic high fantasy works. Ritchea used narrative theory and frame theory to map Tolkien's writings and to learn the foundation for creating imaginary story worlds. "By looking at how to create realistic fantasy worlds, I hoped to better understand my own writing as well as how we, [as humans,] interact with our imagination," Ritchea said. "Berkeley opened up my eyes in a way that I did not think was possible," he continued. "For years my dream was to be a theater professor, but after I visited Berkeley and saw the work of my peers, I realized that what I really want to do is to use my talents and love of multi-interdisciplinary learning to create work in an entirely new sector." Tillman sought to explore how music can positively influence individuals. She gained a broad knowledge of music therapy and delved into psychological theory regarding the influences of popular culture. She focused on how certain musical forms affect African American adolescent girls' self-esteem and attitude. "I felt really accomplished to finally be able to share what I have been working on passionately for so long," Tillman said. "I was nervous at first, but the great support from my fellow McNair scholars knocked those nerves right out. After presenting, I...couldn't wait to do a longer presentation in the future." Yang examined two recently-passed online copyright bills: the Preventing Real Online Threats of Economic Creativity and Theft of Intellectual Property Act (PIPA) and the Stop Online Piracy Act (SOPA). Both bills were created to protect and enforce the copyrights laws in America. Yang showed how one could amend the legislation to ensure that businesses on the internet can continue to thrive without fear of piracy or interference from government agencies. Yang looked at how PIPA and SOPA can potentially negatively affect businesses, even when they have not violated copyright laws. "Presenting my research was a great experience," Yang said. "I was able to meet others who are in the same field and who have the same interests. I am proud having accomplished this mission, and I would like to continue my research in the future." Attention Deficit Hyperactivity Disorder (ADHD) is a neurodevelopmental disorder that is characterized by the symptoms of inattention, hyperactivity, and impulsivity. ADHD is traditionally viewed as a childhood disorder, however ambiguity exists as to the impact of this disorder on various functioning outcomes during young adulthood. Young's research project investigated the association between individuals diagnosed with ADHD during childhood and how ADHD impacted their educational attainment, delinquent behavior, and driving safety during young adulthood. "Because my ethnicity is under-represented, I found it difficult to receive the right support and motivation to continue pursing my dreams," Young said. "Because of this wonderful program, I not only have knowledge about getting into graduate school, but I also have the support and motivation to continue my education." P. aeruginosa is a common bacteria that can survive in a wide variety of environments and is commonly encountered in everyday life. This resilient bacteria does not infect healthy tissue but can heavily damage any compromised tissue. P. aeruginosa infection is responsible for 50 percent of case fatalities of patients who are hospitalized with cancer, Cystic Fibrosis (CF), and burns. Zank's study explored strategies with which the healthy lung inhibits biofilm formation by P. aerugionosa in order to determine which of these strategies is not employed by the CF lung. "My participation in the McNair Scholars Program has been like pulling a curtain open to the world of scientific inquiry, and it has enabled me to see myself as a valuable part of that world," Zank said. "The McNair Scholars Program showed me that I can focus my talents and help vast numbers of people simply by studying the things that I am interested in and by sharing my discoveries with the rest of the community."